HAPPY HAPPY HAPPY BIRTHDAY WAYNE- May you continue to be blessed with good health for many more years! We all love you and thank you for the wonderful pinball legacy we still happily enjoy today! Happy 100TH birthday Wayne! I love my Spirit of 76! Amazing story about that game as Wayne predicted it would sell 10,000 units. He was laughed at at the time, but when number 10,000 rolled off the line, it was presented to the man himself. I believe he still has it to this day. Kings and Queens is one of my favorite EMs. I like the ball walker so much that I have an idea to reuse the concept in a different way someday. I sent this photo to Wayne just a little while ago. A big Happy 100th Birthday to Wayne indeed! Thanks for all the EM pinball fun you help create that we still enjoy to this day! Now you can eat your cake and play some pinball too! Happy Birthday Wayne. What an incredible achievement, long live the King! everyone go check out the interview with the legend himself on the E.M. dungeon feature of the spooky pinball podcast! its well worth the time, and I think we all kind of of owe it to him, he is a pillar of the pinball world. Happy Birthday Sir, Thank you for making this hobby so great for so many great years!!!! I just realized that I'm getting my first E.M. tomorrow!!! Its not a Wayne creation, but any E.M. always makes me think of all the great innovations that Mr. Neyens invented. So that's how I'm celebrating his Bday. I say that That July 29th now be know as National E.M. day! or National Flipper day!!!! 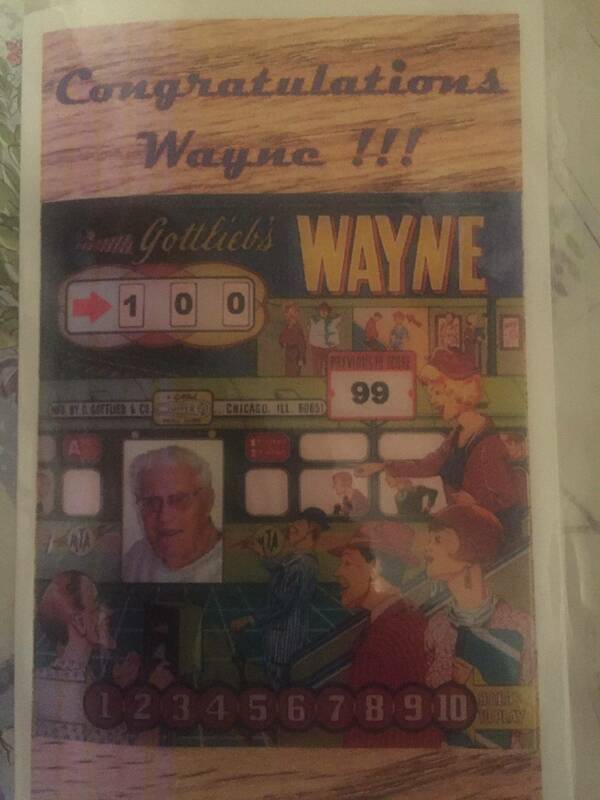 Happy 100th Wayne! Amazing pinball career and legacy! Happy 100th birthday Wayne Neyens!!! A pinball legend! Wow! 100 years old. Congratz! Happy Birthday! If we are judged not by 'what we do' but by 'what we leave' Wayne Neyens is an icon and it is such great news that he continues good health. In a visit to Michael Shalloub a couple of years back I had the privilege to speak on the telephone briefly to Wayne and was struck by his humbleness, continuing interest in the hobby and particularly his charm. Just a wonderful individual. I tried calling him today, but his phone was understandably busy. My brother did get through to him earlier, and reported that he's in excellent health, and is even still driving an automobile! 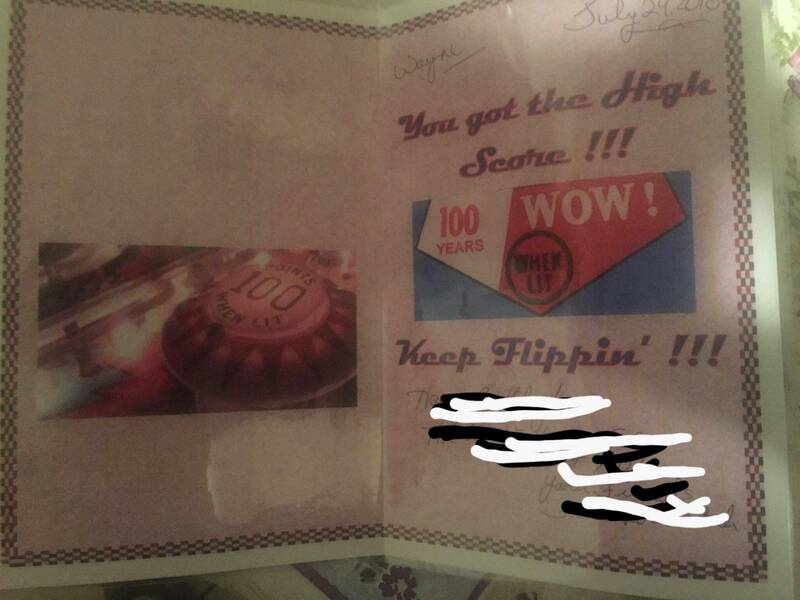 Pretty poor quality photos, but this card was sent to Wayne. He also received a "Spirit of '76" neon clock. Happy Birthday Wayne...have a flippin' good day!! Happy birthday Wayne! My how the years keep flying by. I guess I'll mix up a drink and play a few games of Frontiersman in your honor. Not like I don't do that every night anyway. Let's see, that one's 63 years old now and still one of the all time classics. Pure genius in design. Thanks! are 2 of my favorite pins, to name a few of many. Happy Bday Wayne, hope you got another decade in ya. Happy 100th Birthday, Mr. Wayne Neyens!!! I was working on a Buckaroo today, and played my Flipper Parade. Then discovered it was Mr Neyens' 100th birthday. I hope I'm still playing his games when I'm 100! A non-Pinsider asked me to post this greeting for Wayne. He designed the first game I ever played a 63 Gaucho that my cousins owned when I was around 9 or so I've been hooked ever since. I hope he has a wonderful birthday and many more. I understand Wayne is the guy who gave us the pop bumper spoon switch. 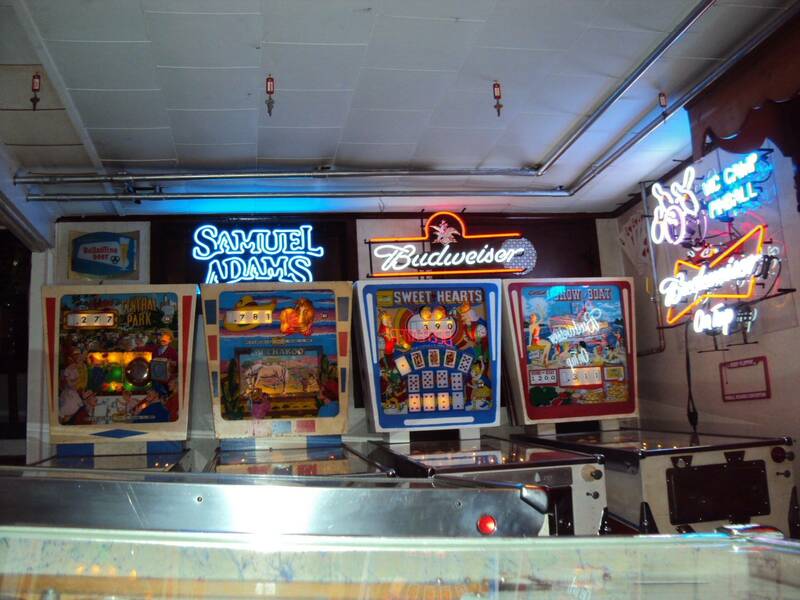 You've done so much for the pinball world over the years. Thank you! Happy birthday, Wayne! Thanks for all you’ve done for pinball! It feels so good having Wayne Neyens present in the year 2018 to wish him a Happy 100th Birthday! May he have many more to come. Yesterday I played my Buckaroo, Sweet Hearts, Show Boat and North Star in his honor. Happy Birthday Wayne. I unfortunately only own Ed Krynski games out of my wedgeheads, excepting Atlantis which is Jeff Brenner. Maybe some day I'll get one of his wonderful creations. Us EM guys are getting older and we need to hang on to all of us that we can. It's great to have a big part of pinball history still with us..
Wedge Heads.. "Very Happy Birthday!" thank you for everything that you've done to make pinball what it is today! I had the absolute honor of joining Wayne Neyens for his 100th birthday celebration. Much can and has been said about his amazing designs, sharp engineering mind, and beautiful games - more than I can articulate here. 1) Building games as quickly as possible to try to keep all the factory workers on the line. People mean a lot to Wayne and it shows. 2) A troubleshooting master - his understanding of the circuits he designed is still as sharp as can be. 4) A true gentleman, humble, always kind and helpful to all around him. The afternoon before his birthday, we gathered to play his beautiful Spirit of '76 (if you are not aware of that story, please, listen to the interview with Wayne at http://foramusementonly.libsyn.com/episode-392-interview-with-wayne-neyens-01-18-2017). The top qualifier got to play against the man himself! Friendly competition ensued and I was able to make a high score after several attempts. The suggestion was made to take the top three finishers and face off against the master. This was a once-in-a-lifetime experience - to play pinball with -the- Wayne Neyens. He got double my score! It was incredible to watch him play. Wayne has given me a gift that I can never repay. His games have stood the test of time, his kind spirit and friendly nature are an inspiration. 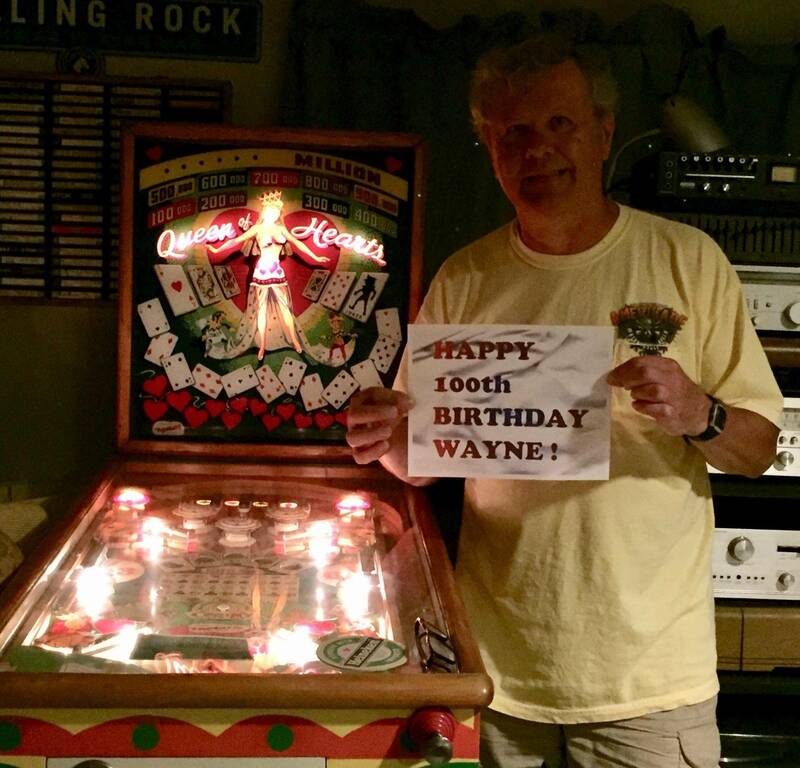 Thank you, Wayne, for everything you have done and continue to do for pinball, and for the world. A truly amazing man, and a genuine living legend. I only hope that I get the chance to meet him personally some day. Love my K. C. Jones! ... and my Straight Shooter! Almost finished shopping my Sittin' Pretty! Have a Joker! Just picked up a Slick Chick! Do not lose that beer gut, as I am sure that is what is keeping him alive. Happy 100th! Wayne. Wow! 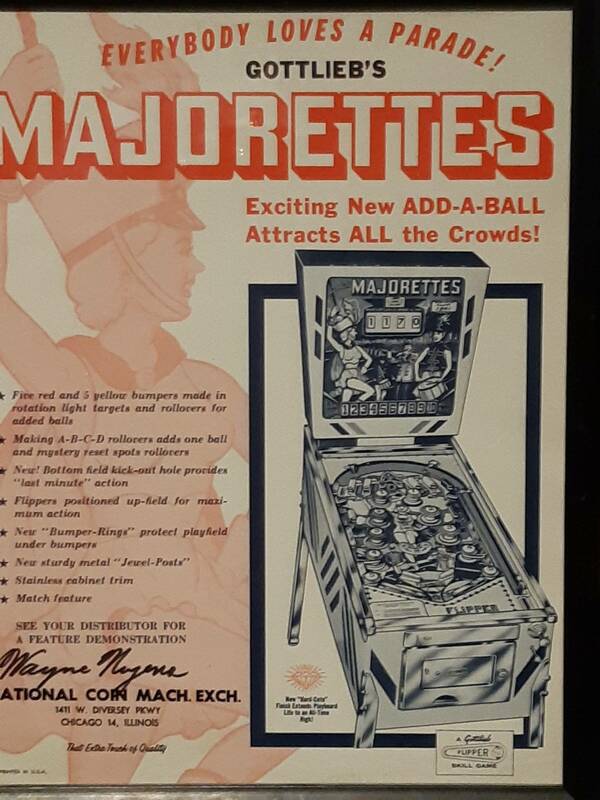 You entered the world in 1918, before pinball was even invented. 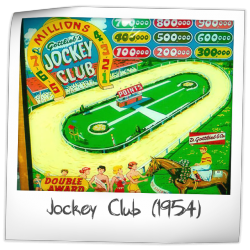 Now, due to your hard work have helped create a pastime, hobby, and amusement that has put a smile on millions of faces, worldwide. Thank you, Wayne. What does he say is the secret to his longevity? I never knew it was Wayne who started the pinball fashion trend of guys wearing cargo shorts to pinball events. Nowadays you see tons of guys wearing cargo shorts at pinball festivals/expos. One of my fondest memories was meeting him at Expo and getting him to sign my Majorettes flyer, which hangs on my office wall. 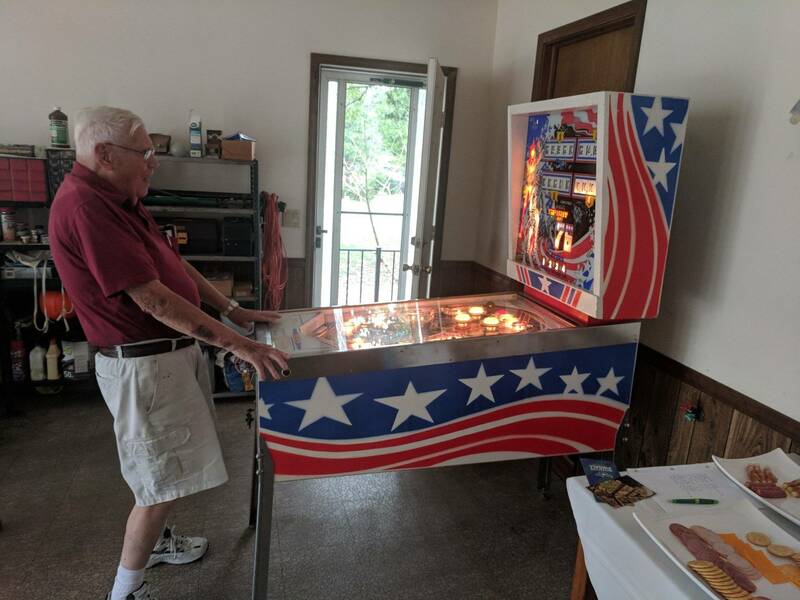 Happy 100th Birthday to a true giant and gentleman of the pinball world!! Wayne Neyens. Design legend. Best selling 50's machine: Royal Flush with 3400 sold. Bset Selling 60's machine: Gaucho with 5350 sold. Spirit of 76, 10300 sold. Ipdb has 180 machines accredited to him. 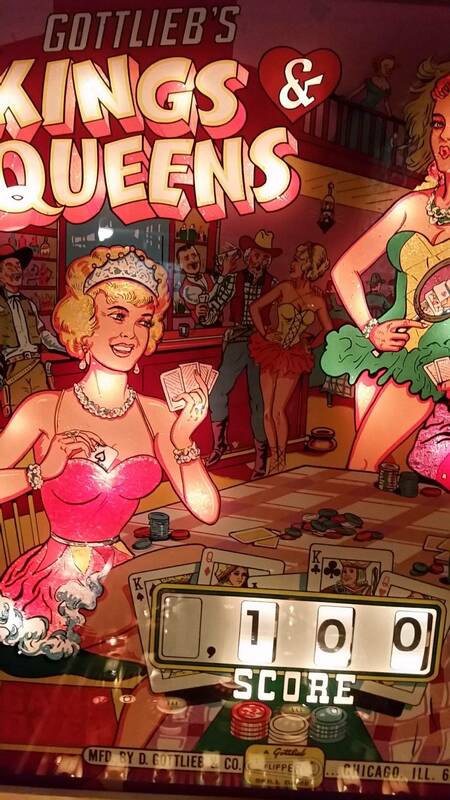 Hope I'm playing pinball at 100, wait a sec that will be the year 2084. I'll play some Robotron too! Here's an article about Wayne and his recent milestone. From the article: Queen of Hearts, released in 1952, is his favorite game, he said. "Not because it was the greatest game we had, but because it had the greatest circuit in it. It had a circuit in it that was fantastic,” Neyens said. “I dreamed it up on a Sunday afternoon, and I thought, ‘I wonder if I could draw that circuit.’ I thought if you could draw that circuit, you would have to be a genius. I'm not familiar with Queen of Hearts. Does anyone know what circuit or feature he's referring to? If so, can you describe it? It is the ball return circuit under the playfield - the complexity involved is similar to the bingo trough logic. Aside from the schematic drawing, there are also timing issues electrically/mechanically as certain switches have to close at particular times. I've never worked on one, but after speaking with Wayne in that interview, I ordered a schematic. I've been waiting for that issue to come out. How can I get one?